Moist, flavorful and no frying needed. Oh, humble pork chop, how many ways do we love you? Braised. Seared. Fried. Barbecued. Stuffed. Sauerkraut. Apples. Onion. 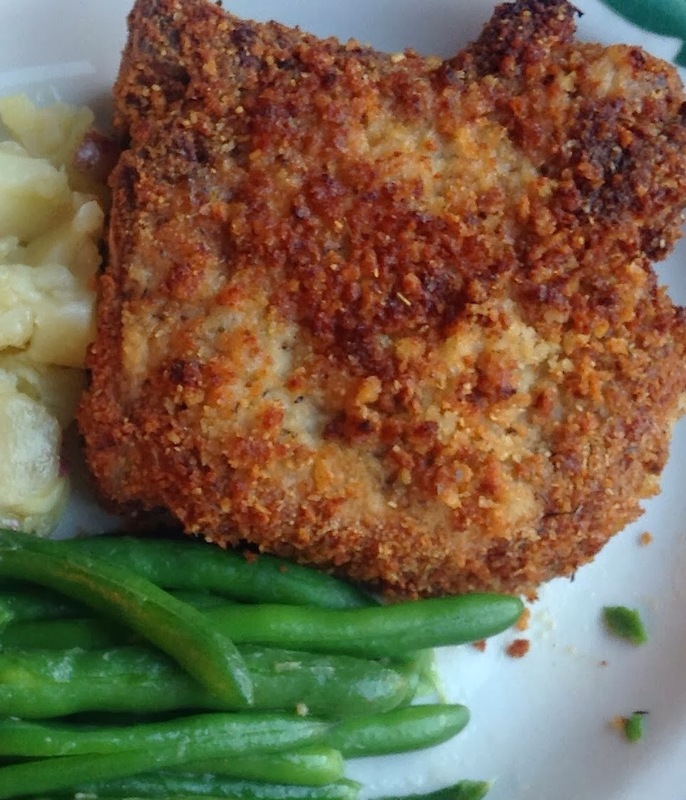 Who doesn't savor a pork chop cooked/baked to perfection? Oh, my grandfather just loved them. I wish he were alive today so I could serve him some of my favorite ways to prepare them which he never realized. This recipe is a delight. 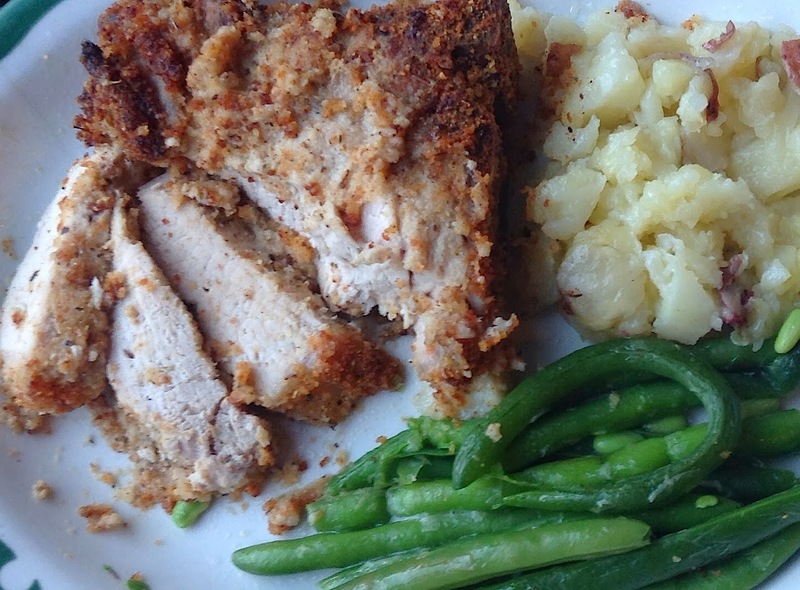 It's inspiration was a You Tube video of chef who smeared a pork chop with mayonnaise and then breaded it. GENIUS! Why didn't I think of that? The mayo held the breading with confidence. Hello .... bottled, salad dressings .... which are basically the same concept as any mayonnaise: oil and egg, with the addition of flavorings. Correct? 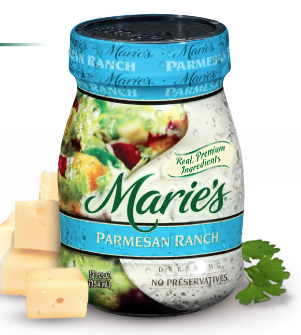 I just happened to have a jar of Marie's-brand Parmesan/Ranch dressing in my fridge given to me as a sample by reps of that company for the produce department in which I work. I settled on that for my experiment. I've made this several times now. And, honestly, I really, and truly, love these pork chops. 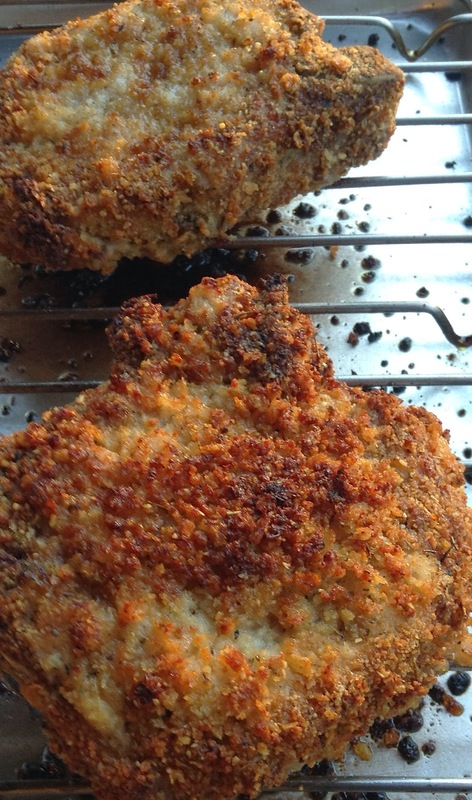 They are moist because of the "dressing" but not soggy because of the Panko bread crumbs. They are not fried. Instead the bake on a rack in a shallow pan so heat is evenly distributed for perfect roasting. Pre-heat oven to 400 F.
Using a damp cloth or squeezed-out wad of paper towel ... wipe the pork chops ... Usually, they contain bits of bone, etc. Mix all dried ingredients on a sheet of wax paper. Now roll them and pat them in dried ingredients.... Use dried herbs ... to your preference. Lightly spritz the chops with a spray of PAM. 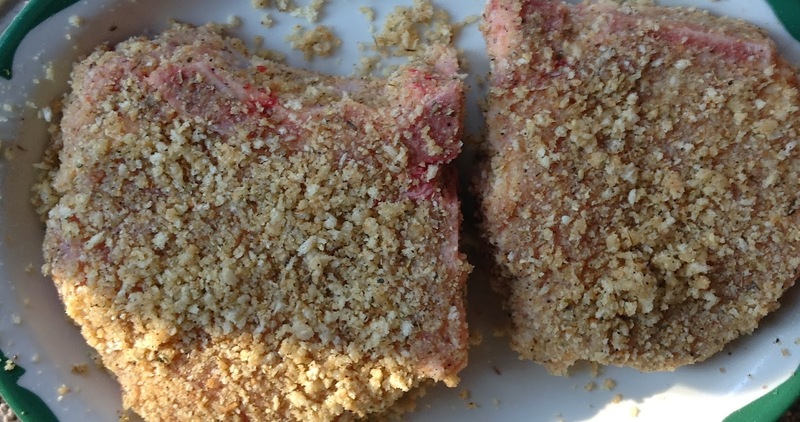 Place breaded chops on a wire rack inside a shallow pan. This rack is important, so don't omit. Bake/roast chops for about 40 minutes without turning. Ideally, you want an internal temperature of 160-170 F degrees. If you want the top a bit crunchier, place under broiler for just a minute or two never taking your eyes off the chops since they can easily burn. 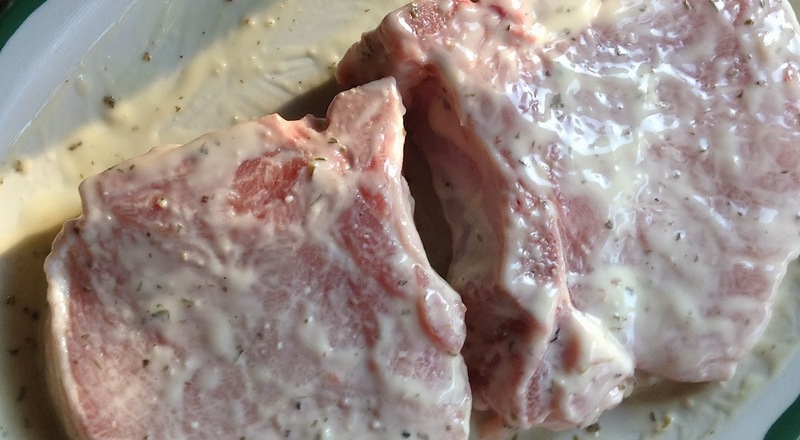 Allow chops to rest 10-15 minutes before serving.